Matthew will be 3 on his birthday later this summer. It's hard to believe it's time for him to be starting preschool already! I just learned today that he made it off the long waiting list and into an afternoon class for the 2014-2015 school year! The class is "integrated" and each of the morning and afternoon sessions has 12 students. The morning session is what's considered a special education room and as such is made up of 8 students with IEPs and 4 students without IEPs. The afternoon session is not considered a special ed class, but still will have 6 students with IEPs and 6 students without. I'm so excited for Matthew to participate in this classroom and am equally excited that his brother will join him in his preschool class next year when he's aged out of the Help Me Grow program. He will attend school for two and a half hours each day four days per week! I'm so excited for him to participate next year, I'm sure he will love meeting new friends and having an opportunity to play and learn!! I have an appointment in a few weeks to meet with the folks from the preschool to get all of his paperwork completed! This Life I Live by Rory Feek of the country duo Joey & Rory is an awesome blog written from the perspective of a father to three daughters, the youngest recently diagnosed at birth with Down syndrome. As a lover of country music, I've heard Joey & Rory on radio, seen their TV show in the past and have also seen them on country music award shows so I was surprised when I learned this morning that they have joined our community of families who love someone with DS. Welcome to the club Joey & Rory, you are in for a beautiful ride! Today we are exactly 45 days out from Luke's open heart sugery. I can't believe it, 45 days. When I started my "countdown" on the calendar a while back I certainly didn't expect the days to roll by so quickly. When we learned of Luke's heart defect prenatally in August 2012 (which was over a year and a half ago), I was truly a different person. I knew nothing of cardiac anatomy nor special needs. My thought process was so much more narrow, although I didn't realize it at the time. Not to say I'm by any means an expert at this point, but I do feel like I've had an opportunity to learn so much about Luke's various diagnoses and I do at least feel educated for the most part. Interestingly however, it's surprising to me that following so many appointments and tests and discussions about his heart... I continue to learn more about his specific defect. At the highest level, the heart is responsible for moving oxygen poor (blue) blood to the lungs via the right ventricle through the pulmonary artery to the lungs, where capilaries infuse the blood with oxygen (it becomes red) and is then sent through pulmonary veins to the left ventricle where it is pumped through the body. The body uses the oxygen, the blue blood returns to the right side of the heart, is oxygenated by the lungs, becomes red, pumps to the left side of the heart and so on. The US Department of Health and Human Services has a great webpage dedicated to "How Your Heart Works" if you're interested in gaining a high level, but still detailed overview of the organ that is in charge of operating the body's circulatory system. In Luke's specific defect, Atrioventricular Canal Defect or AV Canal for short, there are a number of structural problems present. 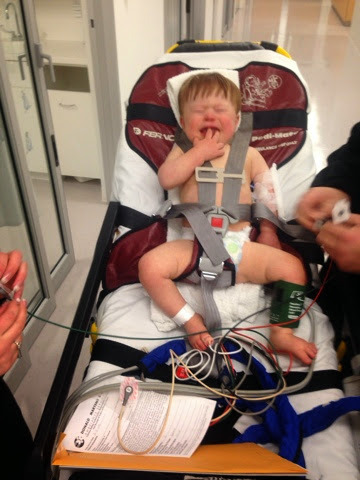 He has a hole between the top two atrial chambers known as an Atrial Septal Defect or ASD. He also has a second hole between the bottom two ventricular chambers known as a Ventricular Septal Defect or VSD. Additionally, he has one valve that we refer to as a "common mitral valve" that in a normal heart would be referred to as two separate valves, a Tricuspid Valve that would connect the right ventricle's atrial and ventricular chambers and a Mitral valve that would connect the left ventricle's atrial and ventricular chambers. In an AV Canal defect, The ASD is placed towards the bottom of the atrial chambers and the VSD is placed towards the top of the ventricular chambers so they end up meeting in the middle to create one large 2D hole in the middle of the heart, which when combined with the common mitral valve creates a 3D hole that connects many various components. As a result of this anatomical defect, some of the oxygenated or red blood in the left ventricle that has just come from the lungs and is ready to be circulated throughout the body ends up passing across the VSD and mixing with the blue or de-oxygenated blood creating a right to left shunt. (My understanding is that the left to right shunt creates a loud "wooshing" sound - a murmur that is heard with a stethoscope). The extra volume or blood pressure in the right ventricle, if left uncorrected - over time cause will cause the ventricle to become enlarged which is considered to be irreversible damage. Because there is now extra blood in the right ventricle and it has to go somewhere, it passes through the pulmonary artery to the lungs, where pulmonary hypertension is often detected due to the increased volume of blood present there. Over time, again - left uncorrected, the lungs will become enlarged which is also considered irreversible. Individuals with this defect typically undergo open heart surgery to repair the defect between two and six months of age due to failure to thrive/poor weight gain as the body burns more calories than it consumes because the heart has to work so hard to pump blood and / or because of poor oxygenation due to the shunting which causes the skin to be gray, blue or purple. In Luke's case we are waiting until he is 16.5 months old for the repair based on the findings of a heart catheterization that was performed when he was four months old. We learned during that procedure that an unusual piece of cardiac tissue grew up to cover a portion of his VSD so blood flowing across that area of the defect is less than you'd expect, which helped us to understand why he wasn't showing the clinical signs of heart failure - failure to thrive and / or poor oxygenation. To repair the ASD and VSD, our surgeon will patch each of the holes with a synthetic material. Additionally, Luke's heart isn't equally balanced - typically, the right and left ventricles should be the same size, but his heart has a mild to moderate right ventricle dominance (which for a period of time prenatally had us worried that we'd have to do a single ventricle repair of his AV Canal, which would be much less than ideal). The right ventricle dominance becomes important when considering the common mitral valve that will be split into two valves as it will have to be split in equal proportion to the sizes of each side of his heart. I recently learned that this becomes even more complicated for Luke because the papillary muscles that are responsible for contracting during systole to prevent regurgitation of blood into the atria and that line the exterior of the common mitral valve are placed very close together. These are the muscles that will attach the valves to the correct chambers of the heart during the repair and they will have to be separated when the valve is split. This will require a very steady hand to be done correctly. Nutrition is key leading up the surgery and we are starting him Pediasure immediately for the calories to help him gain weight and protein for it's vital role in healing muscles. The heart is living tissue that will continue to evolve after the repair. It will likely be years before we are aware of any possible muscle/valve deterioration, including leaky valves or valve stenosis. In general, individuals with DS are at a greater risk of pulmonary hypertension over the course of their lifetime due to the combination of poor muscle tone and anatomically small airways - this can be a major contributor to an increased number of respiratory issues and is something we will always have to monitor very closely. We expect for surgery to last 6-8 hours, although 8 hours is on the long side - this will include the time it takes to get him under anaesthesia. Following the surgery, the surgeon will come out to talk with us and we can expect to see Luke an hour to an hour and a half afterwards. There are extrordinary precautions taken in the OR and CICU to mitigate infection including sterile environments and repeated handwashing. Infections are a huge quality metric for the hospital and something they take very seriously. We should expect for Luke to come out of the OR with a fever and to have a fever for some period of time following the surgery. This is normal because during the surgery while Luke is on the heart/lung bypass machine, his white blood cells will come in contact with the plastic tubing within the machine and they will tell his body that the plastic is a foreign object - his body will respond as if it's fighting off the foreign object and a fever will ensue. Following the surgery (while still in the hospital or shortly following discharge), minor infections like ear infections and tracheitis are fairly common. That said, major infections like those of the breastbone and around or in the heart are very rare as a result of the surgery. Luke will receive blood products/transfusion during the operation and we will need to validate that he doesn't become immune to the Hepatitis A vaccination following the repair. If this is the case, he could have an adverse reaction to the vaccination that will be due for him at his 18-month well child checkup with the pediatrician. Average total recovery time is about 8 weeks. Once we are home from Boston, Luke will need to be isolated as much as possible from other people / germs for at least 4 weeks. Nearly two years ago, Dustin and I joined a special new community... made up of members spread out across the United States and beyond. We were brought together by Down syndrome. Although Luke was one of an estimated 220,000 individuals born across the globe each year with Down syndrome, in the moment that I learned of his diagnosis, I felt like I was living alone on an island... one that was primal and devoid of life. However, as I began to explore my new habitat, I stated to become more comfortable being there. I learned how to navigate the twisting roads, found fruit to nourish my body and could even feel God guiding me through the foreign place and along the way, I could tell that He was feeding my soul. I finally discovered other humans living there. We became friends... the kind of friends who knew what it was like to live away from what used to be their old homes. And the longer I lived there, in my heart, I knew that I could never leave. The once seemingly deserted island had become the most wonderful home that I never even fathomed could exist on this earth. Because of that experience and the extreme highs and lows that were a part of the journey, I joined a group of other parents with young children who have Down syndrome to share my story. Together, we assembled the stories of our diagnoses to help others who are new members of our community. Our goal is to show them that they are not alone. The compilation of our stories is entitled "Unexpected" and it includes stories of confirmed prenatal diagnoses (like ours), experiences from those who had "soft markers" that eventually led to their children being diagnosed at birth as well as what it was like for those who had no prenatal testing or soft markers and learned following their baby's birth that Down syndrome was now a part of their lives. This was a grassroots labor of love as the stories were written and shared without a stipend and the wonderful ladies who did the behind the scenes aggregation were not paid for their efforts. We took on this project with the goal of getting our stories into the hands of as many medical providers as possible who are charged with delivering a diagnosis in the hopes that we could touch the lives of others who are now internalizing what it means to have a child with Down syndrome. If you'd like to read our story, choose the link for "Prenatal" and then once on the table of contents for that section, scroll to the bottom and click on "Luke". This update is a few days overdue. Nearly a week ago, on Friday, March 7th Luke saw his pediatrician for a cough that had a bit of a wheeze associated with it. Following an exam, Luke was prescribed an albuterol inhaler. We discussed Luke's recent history that included croup, bronchiolitis (which required him being admitted for two days) as well as pneumonia and essentially how the residual effect was that Luke's airways were likely still a bit inflamed, causing them to have some restriction, hence him being placed on the albuterol. We talked about how Luke would need to be seen again if his symptoms changed or if he still needed the albuterol in five days or if he needed it more than three times a day for two days straight. Friday night was miserable..... he cried and cried and cried and neither Dustin nor I got much sleep. Luke had physical therapy at 10 AM Saturday morning and he wasn't a very willing participant, maybe only completing about half of what was planned for him. By 11:30, we decided he needed to be seen again. Our pediatrician's office sees patients on Saturdays, but our doctor was off and the other schedules were full so the nurse suggested we come in to Express Care. I wasn't interested in Express Care so we packed up a few bags and drove to Cleveland to the Pediatric ER at Fairview Hospital. By the time we got to Fairview, Luke's temp had spiked at 104.6, he was a bit tachypnic at about 65 breaths per minute (vs normal at 40-45) and he had an elevated heart rate... this combined with his history led the doctor to sharing that we would be admitted before he'd even completed an exam or ordered any tests. We went through the motions of swabbing for RSV, completing another chest x-ray and drawing quite a few labs. The RSV was negative, but the chest films showed a medium sized opaque spot on one of the lobes of Luke's right lung, which told us that his pneumonia was back. Additionally one of the labs that the doctor drew was to determine Luke's NTP or Natriuretic Peptide. We've never had his NTP evaluated so it wasn't something that I was familiar with, but it came back elevated, which the ER doctor suggested was a sign of congestive heart failure. 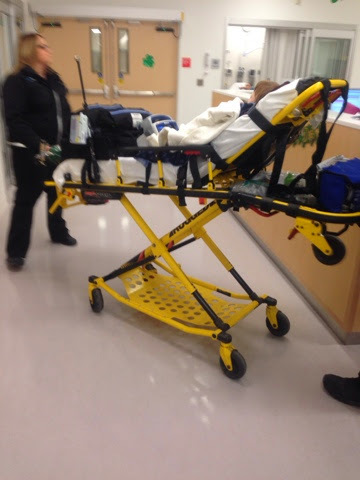 This led to us being transported to the Clinic's Main Campus and earning a room in the pediatric ICU. Before the squad came to get us, the ER nurse attempted to start Luke's IV fluid and discovered that his vein had blown at some point after the labs had been drawn so the site we were using in his right arm was no longer functional, which meant another poke in his left arm to start the IV. The squad came for us and off we went towards downtown. Once in the PICU, we got settled some and the doctors started to flow in... residents, hospitalists, nurses, nurse managers, cardiologists, etc. They confirmed the pneumonia and suggested that they thought Luke had a virus overlaid on top of it, which made him look and feel even worse. We talked about the elevated NTP and learned that the cardiologist wasn't too concerned about it... in his words "We know that Luke has an element of heart failure because of his AV Canal defect so of course his NTP is elevated, that's why we've never drawn it on him." He went on to say however that the recurrent respiratory infections were troubling to him and made him wonder if Luke's heart function was worse than it's been in the past so he ordered an echocardiogram that was eventually performed on Monday. 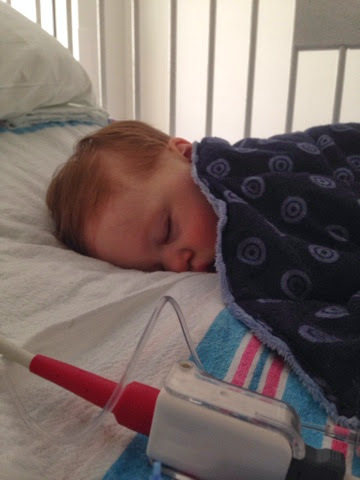 We started IV antibiotics (Ceftriaxone) and Luke continued to receive IV fluid as he had mainly gone off milk and solids by that point and on Sunday evening, we were moved from the PICU to the general pediatric floor. Once on general peds, the doctors seemed concerned that we were giving too much fluid via the IV.... individuals with heart disease can get fluid build up as their body sometimes has a hard time disposing of it so we slowed down on the fluids even though Luke's oral fluid intake was still decreased. Monday early afternoon Luke had his echo and we were discharged late Monday afternoon with oral augmenten to treat the pneumonia. We are still awaiting the results of his echo. Yesterday was our first full day home and it was a little rough. Luke still isn't real interested in eating... he full out refuses solids and only takes milk about a half ounce at a time. Typically his fluid intake is about 25-30 ounces per day and by late afternoon yesterday he had only taken 11 ounces. As evening rolled around, we got another 5 in him and then another 4 before bed so I was satisfied with 20 ounces although I'd be lying to say it wasn't a chore to get him to eat. I hate taking time off work, but I decided to stay home again today to observe him and make sure he gets enough fluid.